With a bit of luck and fingers firmly crossed, picnic weather is just around the corner – or somewhere on the distant horizon, at least! 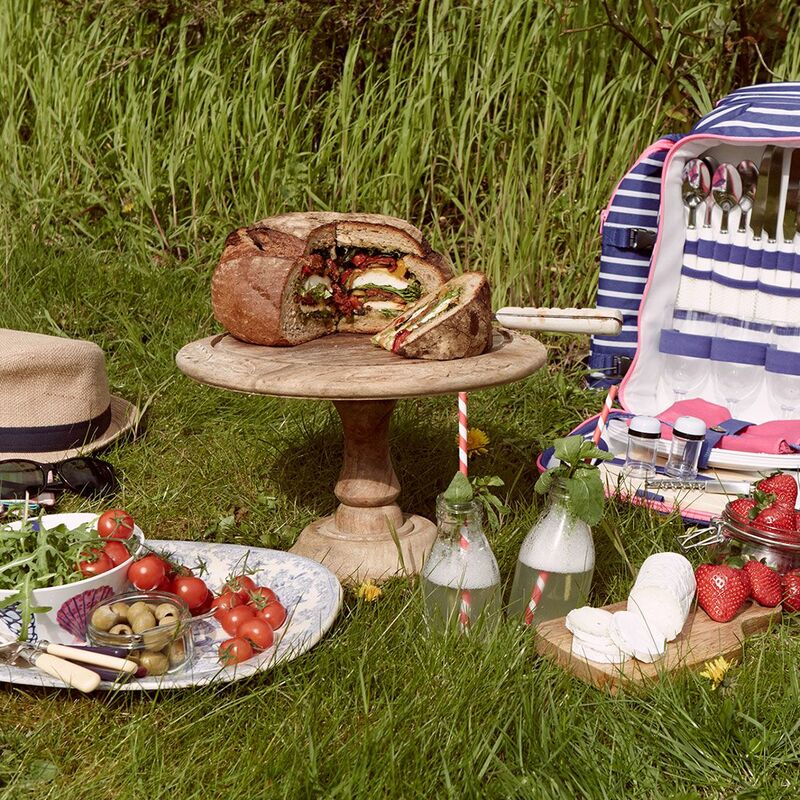 Even if the opportunity to pack a picnic and head outside is not yet upon us, it’s good to have some ideas in the bag for alfresco dining opportunities whenever they arise. 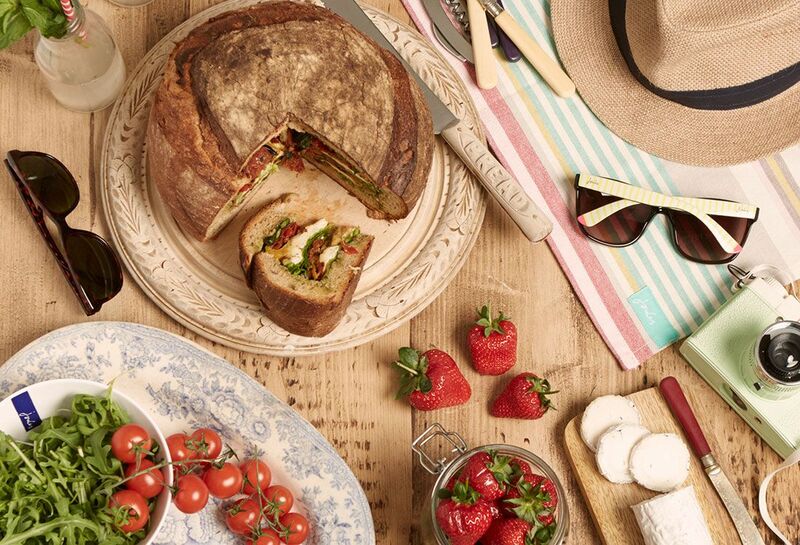 Introducing the picnic loaf…ideal for sharing and perfectly portable too. This picnic loaf is one you’ll want to have in your repertoire; the term crowd pleaser could have been created for it. A take on the traditional southern French filled sandwich Pan Bagat, filled to the gunnels with all manner of good things and left to rest overnight for the flavours to work together. Ideal for sharing (it’s huge!) and perfectly portable too. It’s worth planning a gathering for a slice alone. Put the sliced vegetables in a bowl and drizzle with olive oil, mixing to make sure they’re all coated. Cook in batches on a griddle or under a medium grill until softened and charred slightly at the edges on both sides. Season and set aside to cool. Carefully cut the top off the loaf, set it aside. Hollow the loaf out (use the bread for breadcrumbs to stash in the freezer) don’t make the walls and base too thin – you want it to hold its own. Rub the clove of garlic around the inside of the loaf and then using a spoon spread pesto all over the inside walls and lid. Build layers of veg, lettuce, cheese, sundried tomatoes and olives, press them down gently to make sure the loaf is really well packed. Finish with fresh basil. Put the lid back on. Wrap the loaf tightly in clingfilm, place on a plate and put another plate on top, add something weighty to the top plate and leave overnight (or at least for a few hours) in the fridge. This will allow the layers to form tightly and the flavours to mix together. Use a bread knife to cut into thick slices.